Your first piece of homework: Find out what the length and weight regulations are in your province. Try to take maximum advantage of the weight laws to maximize payload. Some provinces, as in the case of Ontario, require compliance with the Safe, Productive, Infrastructure-Friendly (SPIF) regulations; others don’t. This will have a big influence on how the axles are set up and spaced. In provinces where you don’t need to comply with the SPIF, you may need to spec trucks with shorter wheelbases and lower front axle ratings. It’s also important to understand how the 2010 federal engine emissions standards may require some changes to be made when spec’ing for new truck purchases compared to your current dump truck spec. “The extent of these changes depends upon each dump truck operator’s choice between two available engine technologies, which may also affect truck performance and operating costs over its lifetime,” Lindgren says. Operators can choose an engine aftertreatment approach that utilizes selective catalytic reduction (SCR) technology in combination with exhaust gas recirculation (EGR), or an in-cylinder approach through increased EGR. Both technologies use EGR to circulate a portion of an engine’s exhaust gas back to the engine cylinders and a diesel particulate filter (DPF) to remove particulate matter from the exhaust. A critical difference is the amount of exhaust gas that is recirculated back to the engine; the enhanced EGR approach uses a significantly higher level of recirculated exhaust gases. SCR also mixes a reductant – most commonly a solution of urea and de-ionized water known as diesel exhaust fluid (DEF) – with the oxides of nitrogen (NOx) in exhaust gases. The exhaust then passes through a catalyst, where the DEF reacts with the NOx to convert it into nitrogen and water. Increased EGR reduces NOx by boosting the amount of exhaust gases in the engine cylinder, then slowing and cooling the combustion process and burning off pollutants. The increased heat created with the enhanced EGR approach requires greater engine cooling capacity. Increased EGR also requires more fuel to be injected into the DPF for active regenerations. According to Lindgren, it is important for operators choosing SCR to consider DEF tank capacity and placement. “To support SCR system integration, Kenworth has a range of exhaust and DEF tank sizes and locations designed for dump trucks. This helps dump operators to maintain their wheelbase and body configuration when spec’ing Kenworth trucks with 2010 engines,” Lindgren says. Not all SCR technology engines are the same, however. “An aftertreatment catalyst using copper zeolite is much more efficient than one with iron zeolite at reducing NOx at normal engine operating temperatures,” Lindgren says. “This means engines using copper zeolite are expected to enjoy a fuel economy improvement.” PACCAR engines and Cummins engines both use copper zeolite. Some key questions that need to be answered concern the loads that you expect to haul. For example, you will need a different chassis spec when hauling bulk loads such as asphalt, sand or gravel than you would if you hauled mostly demolition debris. If you’re planning on visiting a lot of demolition sites or are hauling heavy rock, you will need to have the body and suspension beefed up to handle the pounding it will take from the large masses going in the dump body. Your body supplier will have input on this. The hauling question relates to the environment or roads you are operating in. Are you going to spend a lot of time on very rough jobsites or will most of the hauling be long distances on smooth gravel and sealed roads? One of the big mistakes many people make with dump truck engines is they spec too much power, says Lindgren. “You should get just enough horsepower to do the job. Generally, 350 to 485 hp is plenty for most applications. Extra horsepower just uses more fuel, puts more strain on the rest of the drivetrain, and adds cost up front. “If you go with a smaller 13-liter block, you save around 350 pounds compared with a 15-liter block,” Lindgren says. 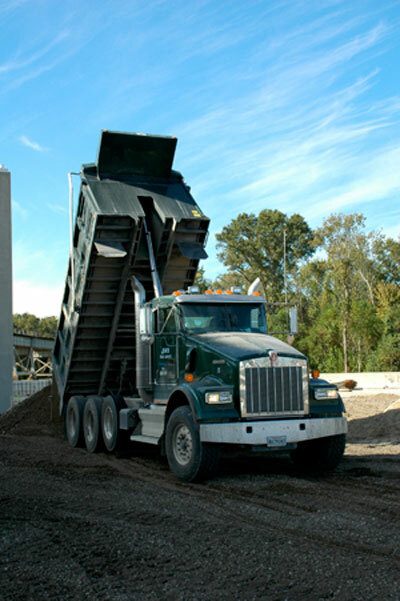 The typical dump truck uses rear axles rated at 46,000 pounds. This covers most trucks with 16 to 21-foot dump bodies with combinations up to 64 tonnes (140,000 lbs.) GCM. Another thing to remember for operating off-road is air filtration. Lots of drivers love the look of dual polished external air cleaners, and these provide excellent filtration with low air restriction. But they are quite expensive compared with under-hood air cleaners. A little money spent up front on a better air cleaner is cheap compared to a dusted engine. And better filtration will usually mean longer life for the filter elements. For example, dual 15-inch air cleaners will last over 7 times as long as a single underhood air cleaner before needing replacement. You can also save valuable pounds by choosing the right suspension. “The difference can be as high as 400 pounds,” Lindgren says of the different suspension options. To avoid hauling around extra steel in the vehicle frame, have the dealer work with a Kenworth application engineer so that you only get enough frame where you need it. You will typically need a strong crossmember at the back of the cab to strengthen the hoist mounting area. If you are planning to add lift axles later, make sure the dealer adds that information to the order so that the frame can be prepared for them. But remember that many of these weight savers will cost more up front. You will need to balance that against the gains you expect to make hauling more payload. Finally, consider a few driver performance-related items. To get the best turn performance and road feel from steering, Lindgren recommends dual small gears rather than a large single steering gear. The dual system will also last longer than a single system. Try to spec as much glass area as possible. “Kenworth DayLite(R) doors give a larger glass area in the main door window,” Lindgren says. “You also want plenty of mirrors."